The mixture of one glass milk and one teaspoon honey gives positive results on the body. Milk and honey has such nutrients, which is effective in many diseases. 1. Honey-Milk has fiber. It improves digestion and beneficial in constipation. 2. Honey-Milk has carbohydrates. It decreases weakness and gives instant energy. 3. Honey-Milk has calcium. It is effective in knee and joint pain. 4. Honey-Milk contains anti-bacterial properties. It increase glow of the skin and darkness reduces. 5. Honey-Milk has protein. It is beneficial to strengthen the muscles. 6. Honey-Milk contains amino acids. It gives good sleep before drinking bed. 7. 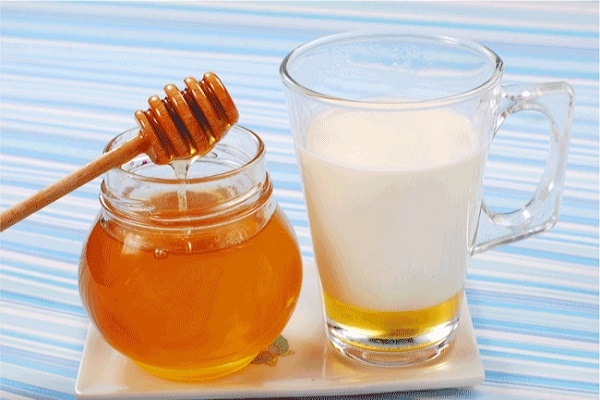 Honey-Milk contains anti-oxidants. It is beneficial to increase stamina. 8. Honey-Milk has vitamin E. It is beneficial to cure pimple and other skin problem. It is also beneficial for healthy skin. 9. Honey-Milk contains anti-septic property. It protects us from infection. 10. Honey-Milk has vitamin D. It strengthens the bones.